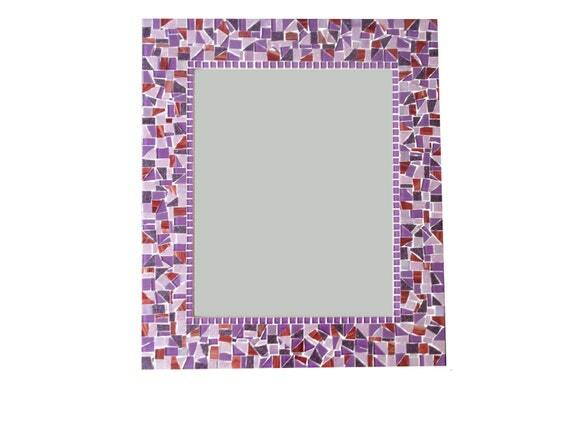 Purple mosaic wall mirror -- handcrafted and made to order. Lovely shades of purple, violet, plum, lavender glass mosaic tiles accented by pops of deep maroon were used to create this large decorative mirror. Yay purple -- what a soothing color! Perfect for a baby girl nursery, purple bathroom, bedroom, office or any room in your home. Some of the tiles are iridescent, some are matte, some are shiny glass -- the different textures really adds to the overall "wow" factor of this wall mirror.